Holiday shoppers looking for creative and modern gifts have many specialty vendors to choose from in Toronto. 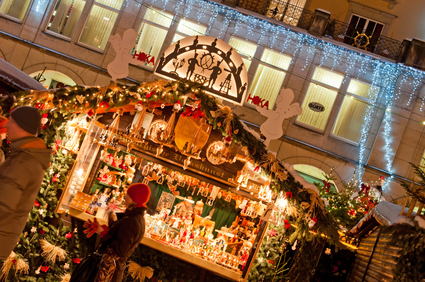 Seasonal markets such as the Toronto Christmas Market and the One of a Kind Show make it easy to shop until you drop. Preston Apartments has pulled together some great holiday shopping events to help you find the gifts you need for friends, family and perhaps yourself. The One of a Kind Christmas Show and Sale (100 Princes' Boulevard) is where residents of 2 Secord Avenue can go for the best handmade gifts. Located in the Direct Energy Centre minutes from the downtown waterfront, hundreds of artisans gather to showcase everything from clothing to outdoor decor. Watch a seminar on Christmas table setting or browse the One of a Kind Hall of Fame feature display. You can even shop online with select vendors. There are many customer service representatives available if you need assistance. Located in the Distillery District, the Toronto Christmas Market (corner of Parliament Street and Mill Street) is one of the best holiday street celebrations in the city. Shoppers have no trouble finding the perfect gift when they browse over 30 vendors featuring Ontario's best artists and craftspeople. While shopping, people can enjoy over 200 free performances including choir performances, sing-alongs and storytelling. They also have a Beer Garden where shoppers can have a drink in the glow of a bonfire. A new market is popping up minutes from Yonge and Dundas Square. Dubbed #localTOmrkt (1 Dundas Street East), this savvy holiday street fair is dedicated to supporting creative entrepreneurs, local businesses and small neighbourhoods of Toronto. Shoppers can support local businesses while choosing between thousands of products from handcrafted glassware to original art. This new pop-up market is perfect for modern individuals who appreciate original gifts curated by industry professionals. Nothing is more convenient than buying all of your holiday gifts only seconds from the train. The Union Station Holiday market (65 Front Street West) offers its patrons just that. For only one week, the Great Hall inside Union Station will transform into a shopper's heaven with 25 artisans bringing their unique gift selections to you. Admission is completely free. The best part is you can simply hop on the Yonge-Spadina subway line, connect with the Bloor-Danforth subway line and be minutes from home at 2 Secord Avenue and 90 Eastdale Avenue. Toronto shoppers can find everything they need for the holidays at pop-up markets and specialty vendors around town. Visit them all, take your time and soak in the holiday cheer.